What an awesome idea for a party. Wedge out a section and clean insides of seeds and melon. Cut skin from wedge and cut legs and eyes out to something similar as seen in picture. Add berries and small melon balls from watermelon, honeydew and cantaloupe. Use blueberries and two half circles for eyes – attach with a toothpick. He is presented on a turntable in the pic to add to the coolness factor. 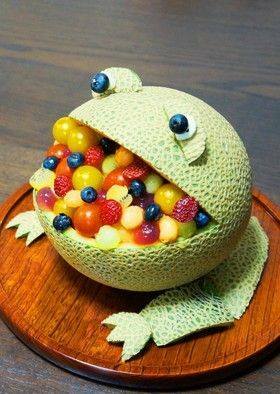 This entry was posted in Crafts ~ DIY ~ Projects, ~Edible, ~Party Items and tagged ball, balls, blueberries, Cantaloupe, frog, honeydew, melon, melon balls, raspberries, watermelon, ~Party. Bookmark the permalink.